Platina, CA - The Consecration of the St. Herman Monastery Catholicon On November 21/December 4, 2009, the Feast of the Entry of the Most Holy Theotokos into the Temple, the catholicon of the St. Herman of Alaska Serbian Orthodox Monastery in Platina, California, was consecrated by His Grace Bishop Mitrophan of the Eastern American Diocese of the Serbian Orthodox Church and His Grace Bishop Maxim of the Western American Diocese. On the eve of the Feast, an All-night Vigil service was held in the catholicon, attended by Bishop Maxim, the monastery's diocesan hierarch. In the morning, Bishop Mitrophan with many clergymen and faithful came for the consecration. In addition to the bishops, thirteen members of the clergy served in the altar: Abbot Hiliarion (the abbot of the monastery), Protopresbyter Stavrophores Lazar Vasilievic (the father of Bishop Maxim) and Petar Jovanovich, Hieromonks Jovan and Damascene, Priest Stevan Kovacevic and Deacon Daniel Mackay, all of the Serbian Orthodox Church; Hieromonk Ioane of the Georgian Orthodox Church; Priest Philip Tolbert of the Bulgarian Orthodox Church; Priest Andre Kovalev and Subdeacon Martinian Prince of the Russian Orthodox Church; and Priest Nectarios Rozadilla of the Albanian Diocese of the Orthodox Church in America. Also present for the service were Monk Silouan and Riassa-monk Timofei of the Monastery of St. John of Shanghai and San Francisco in Manton, California. About eighty-five people filled the monastery church. The services began with the Lesser Blessing of Water, celebrated by Priest Nectarios. Bishop Mitrophan was then greeted at the doors of the church by all the clergy, and the service of consecration began, with Bishop Mitrophan as the main celebrant and Bishop Maxim as concelebrant. In accordance with the rite of consecration, the holy table was washed with wine and rose water, and a procession around the church followed. Bishop Mitrophan then placed holy relics of St. Herman of Alaska and St. Anthony the Great inside the holy table, sealing them with wax mastic and covering them with stone. The Holy Table was then "baptized" and anointed with Holy Chrism, and the walls of the church were chrismated as well. After the service of consecration, the Hierarchical Divine Liturgy commenced. There were many communicants. At the end of the Liturgy, Bishop Maxim greeted Abbot Hilarion and the assembled faithful with the joyous event of the church's consecration. He said that everything that can be said on this occasion has already been said in the prayers of supplication which had been raised to God during the consecration service, and that now all that is left for us to do is to offer heartfelt thanksgiving to God. Being on the holy mountain where the monastery was located, he said, brought to mind the Holy Prophet Moses the God-seer and other Old Testament prophets who experienced God on a mountain. As Bishop Maxim pointed out, this day on which the catholicon St. Herman Monastery was consecrated was also the patronal feast of the great Serbian Orthodox Monastery of Hilandar on Mount Athos. In honor of this providential connection, Bishop Maxim gave to Abbot Hilarion and brothers a large reproduction of the well-known icon of Christ Pantocrator from Hilandar. Bishop Mitrophan then spoke about his happiness in being able to take part in the consecration of the monastery church. He said he had known about the monastery for many years and had for a long time wanted to visit it, having been greatly assisted by the monastery's former abbot, Fr. 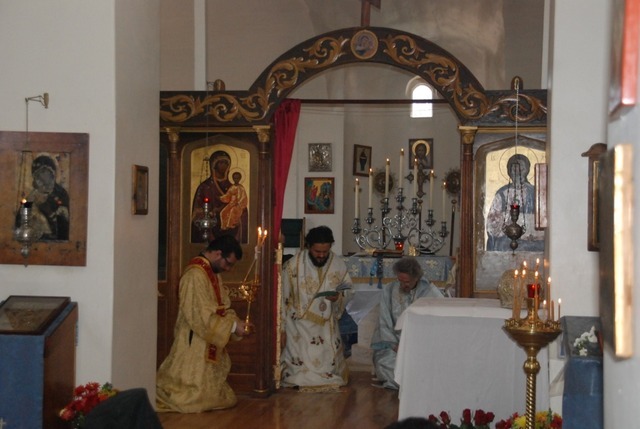 Gerasim, in ministering to the Serbian Orthodox parishes and missions in South America that are under his omophorion. Now, having come to the monastery from the other side of the country, Bishop Mitrophan pointed out how important it is for those in the church to visit one another, in order to know each other better. He brought to mind the visitation of the Most Holy Theotokos to Righteous Elizabeth, and how, through this visit, more was revealed about her Divine Son. The feast being celebrated that day, the Entry of the Theotokos, was very dear to Bishop Mitrophan’s heart. He said that on the eve of this feast, thirty-nine years ago, he had been tonsured a monk. On the feast day itself, he had been ordained as a hierodeacon; and then, four years later, he had been ordained to the priesthood on the same feast. Thus, it was especially meaningful for him to consecrate the monastery church on this holy day of the Mother of God, and he called upon her heavenly intercessions for the monastery brotherhood and pilgrims. Abbot Hilarion then thanked Bishops Maxim and Mitrophan, as well as everyone else who had gathered, and said that the monastic brotherhood had been waiting a long time for this blessed day. After commemorative icons had been handed out to the pilgrims, a meal was served in the refectory. At the conclusion of the meal, Bishop Maxim spoke about the pan-Orthodox clergy retreat that he had just attended at St. Nicholas Ranch in Dunlap, California. He said that such a retreat, which lasted for three days and was attended by priests from several Orthodox jurisdictions, was the first of its kind in America, and that he hoped that it would be repeated in future years. After everyone returned in procession to the newly consecrated church, the Bishops handed out pieces of the white linen garments they had worn during the consecration, with a commemorative stamp imprinted on each piece. The whole day was filled with a tangible sense of God’s grace and mercy. By God’s providence, it was an unusually warm, clear and sunny December day in the monastery, enabling the pilgrims to spend the rest of the day outdoors. Pannikhidas were celebrated in the monastery cemetery for the reposed loved ones of some of the pilgrims. The faithful returned to their homes filled with inspiration from the Divine services, and the monastic brotherhood was filled with gratitude for the blessings bestowed on the monastery by God through the Church’s bishops, clergy and faithful.